South Korea elects a new president in May, and after spending months ousting the sitting president, leftists may win the chance to lead the country. US withdrawal from the TPP was a shock to its top ally in the Pacific, and may push Japan into the trading arms of China. President Trump’s more aggressive trade stance may backfire, and end up strengthening China rather than the US. China’s “One Belt, One Road” (OBOR) initiative is the most ambitious overarching infrastructure project to be proposed in the modern era, and it requires ambitious financing. McDonald’s agreed to sell 80% control of its restaurants in China and Hong Kong for 20 years to state-owned conglomerate Citic and the Carlyle Group, a private equity firm. Silk Road Bonds: The Next Big Thing? Using Silk Road bonds as a funding vehicle for the vast capital needs of the One Belt, One Road (OBOR) project appears a handy catchall subsuming devilish details. Chinese Web giant Baidu has obtained regulatory approval to establish, in collaboration with China Citic Bank, a direct-banking firm named Baixin Bank that will operate online rather than through brick-and-mortar outlets. China is committed to investing more than $360 billion in domestic renewable energy and supporting technologies by 2020, building on its existing position as the world’s largest investor in renewables. In November in Beijing, Global Finance honored winners of our ninth annual Stars of China Awards, recognizing excellence in Chinese banks. Wu Chunjiang, assistant general manager for private banking at China Merchants Bank (CMB), talks with Global Finance about building strength regionally in private banking. The new prime minister of New Zealand has his work cut out for him, despite a relatively strong economy. Given that China’s growth is slowing, the decision to replace Finance minister Lou Jiwei with Xiao Jie is controversial—yet not surprising. The scandal that led to the president's impeachment implicates some of South Korea's best-known conglomerates. 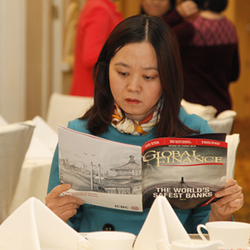 Global Finance magazine honors the best banks in China, acknowledging that the Chinese banking sector has grown and matured to play a major role in global banking. A smooth transition of power to crown prince of Thailand Maha Vajiralongkorn after his father, king Bhumibol Adulyadej, died in mid-October, is looking unlikely, however. Samsung’s soon-to-be vice chairman and heir apparent, Lee Jae-yong, rises to face the challenge of leading the multinational tech giant at a difficult time.